If you've been invited to CLUB222... please see below to join! 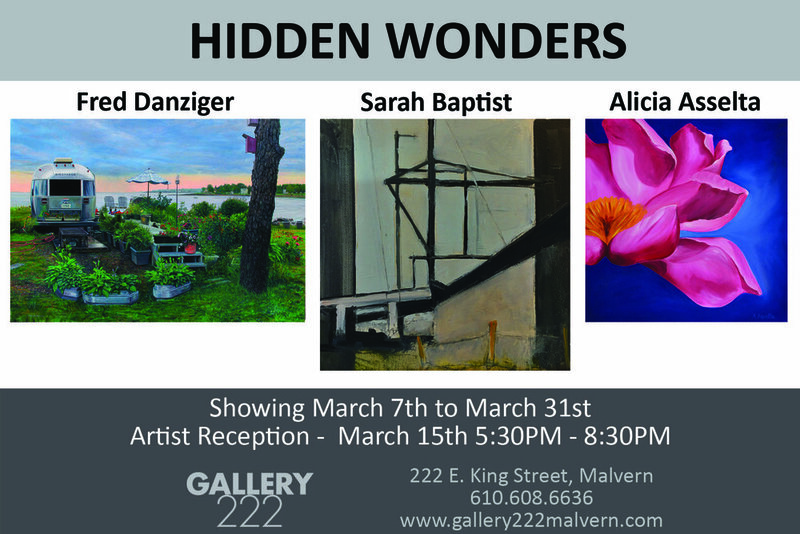 Those are just some of the ‘Hidden Wonders’ you’ll see at our new show opening March 7th. It features the outstanding work of Fred Danziger, Alicia Asselta and Sarah Baptist. Each artist spends hours exposing these hidden wonders for you. For Alicia, it’s focusing on a simple fold of a flower. Sarah feels a “wow” when she sees a simple pop of color surrounded by poles and wires. For Fred, it is a passion and a need to create a “shocking reality” in each of his paintings. .Don’t miss their Artist Reception which is Thursday, March 15th beginning at 5:00pm for you, our Club222 members. We will have a glass of Prosecco waiting for you! Gallery222 is pleased to announce our new exclusive VIP Program, CLUB222. TO JOIN, SIMPLY SUBMIT YOUR NAME AND EMAIL ADDRESS!